While attempting a QAR download the PCMCIA card installed had no data present. Following the aircraft Fault Isolation Manual the first step will be to format the card. Could you please provide a procedure that our engineers can follow to format the PCMCIA card. In your step 2., the instructions say "Use a PC to format the card to FAT 16"
We're not sure what operating system you use on your PC, so here's instructions for two popular ones: Linux, and The Windows. Under Linux, and most Unix-like systems, formatting cards as FAT 16 using a command-line utility is both simple and straight-forward. Under The Windows, locate the card's icon in The Windows Explorer. Right-Click the icon and choose "Format…" from the corresponding menu. In the "Format Removable Disk" dialog, select "FAT" from the "File system" menu, and then click start. Generally, selecting the "Quick Format" check box expedite the formating process. FAQ: Can I use two or more of these 3-port Hubs to connect several FW800 devices to my Mac? This works out of the box for self-powered FireWire devices. Bear in mind that any bus power devices will require an optional power supply. Also, the total device count on a single branch cannot exceed 16, and understand that aggregating multiple devices on a single port does create a potential for over-saturating bus bandwidth if several high-performance (e.g. HDDs) devices are sending data at once. However, for most uses, tiered hubs are fine. Lastly, put your slowest devices on the end of the chain. Just tested the Delock 91694 FireWire 800 CompactFlash Reader under Mac OS X El Capitan (10.11.1). The Delock's 91694 FireWire 800 Reader worked flawlessly, mounting two different SanDisk Extreme® CompactFlash 60MB/s UDMA 16GB cards, and a Transcend 4GB 133X card. Under 10.4 through 10.9 iPhoto opened automatically when the reader was connected or when new CompactFlash cards were inserted. Mac OS X El Capitan is the second Mac OS version to deploy the new Photos app, which does not automatically launch. However, when we opened Photos and navigated to the import function, the CompactFlash card present in the reader was there and ready for importing with the preview feature. We had no issues with the Delock 91694 FireWire 800 CompactFlash Reader under Mac OS X El Capitan (10.11+). Here is a screen shot of the PCM-CR-FW81ECF-03 / 91694 working under Mac OS X El Capitan (10.11.1). Our MacBook Pro has a FireWire 800 port and a Thunderbolt port. We have had a number of customers ask us if the Delock 91694 FireWire 800 CompactFlash Reader works under Mac OS X Yosemite (10.10+). Since we are still running 10.9.5 on our machines, we obtained an extra hard disk, attached it using a Delock Thunderbolt Dock, cloned our system, and then upgraded the clone to Mac OS X Yosemite. Delock's 91694 FireWire 800 Reader worked just fine, mounting two different SanDisk Extreme® CompactFlash 60MB/s UDMA 16GB cards. Under 10.4 through 10.9 iPhoto would open automatically when the reader was connected or when a new CompactFlash card was inserted. Mac OS X 10.10 Yosemite features a new app called Photos, and its behavior is somewhat different in that it did not automatically launch. However, when we opened Photos and navigated to the import function, the CompactFlash card present in the reader was there and ready for importing. By and large, we can say that we had no problems with the Delock 91694 FireWire 800 CompactFlash Reader under Mac OS X Yosemite (10.10+). Obviously your mileage may vary. We will test the under Mac OS X El Capitan sometime shortly after it is released. Here is a screen shot of the reader working under Mac OS X Yosemite (10.10+). Our MacBook Pro has a FireWire 800 port and a Thunderbolt port. We needed to test some samples of Biwin Semiconductor (HK) Company Limited's 300X CompactFlash Cards. In the interst of trying something new we decided to try change test platforms. 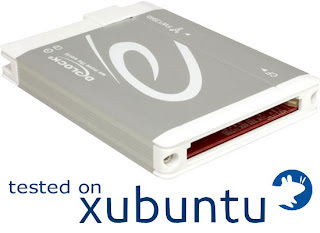 Rather than use our iMac, we used a Xubuntu Linux desktop and our high performance Delock 91694 FireWire CF CompactFlash Reader FireWire 800/IEEE 1394B UDMA. The great news is that the FireWire reader works just fine under Linux, and we were able to complete our benchmarks tests on these non-DLSR grade CompactFlash cards. 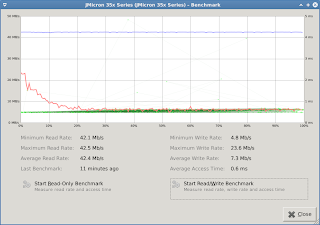 We ran Xubuntu 12.04.2 LTS on our test machine, am Intel Core2 6300 @ 1.86GHz with 2GB RAM. 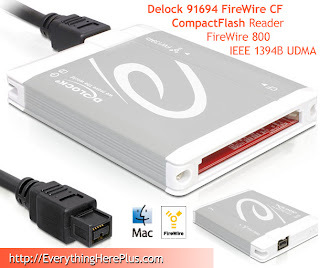 The reader was our Delock 91694 FireWire CF CompactFlash Reader FireWire 800/IEEE 1394B UDMA. 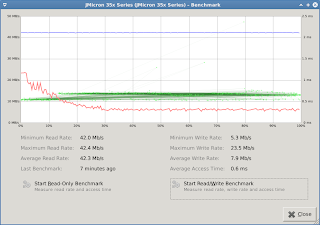 We used Disk Utility 3.0.2 to create the benchmarks. 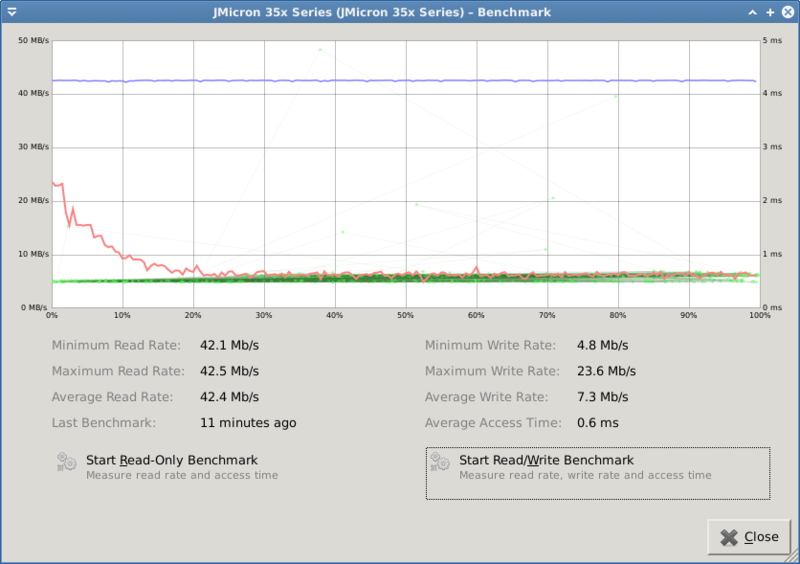 Here are the benchmarks for the Binwin cards. We tested SanDisk Extreme® CompactFlash 60MB/s UDMA 16GB, Transcend 133X CompactFlash 4GB (PIO), and ATP ProMax 300X UDMA CompactFlash 16GB with the Delock FireWire 800 to CompactFlash UDMA Drive Read-Writer 91694. 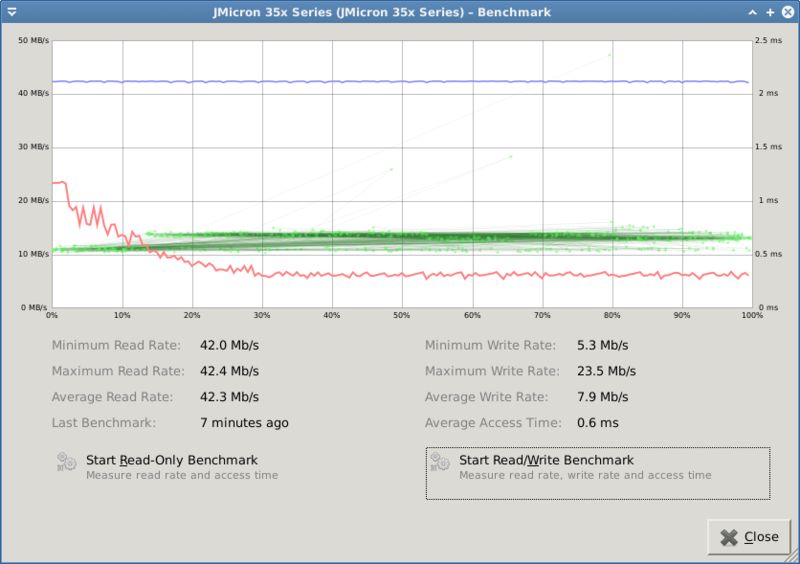 They all worked great, and we'll post benchmarks soon.